The new version of Tor Browser is a milestone release for the project and the team highlights this with the move to version 8.0. 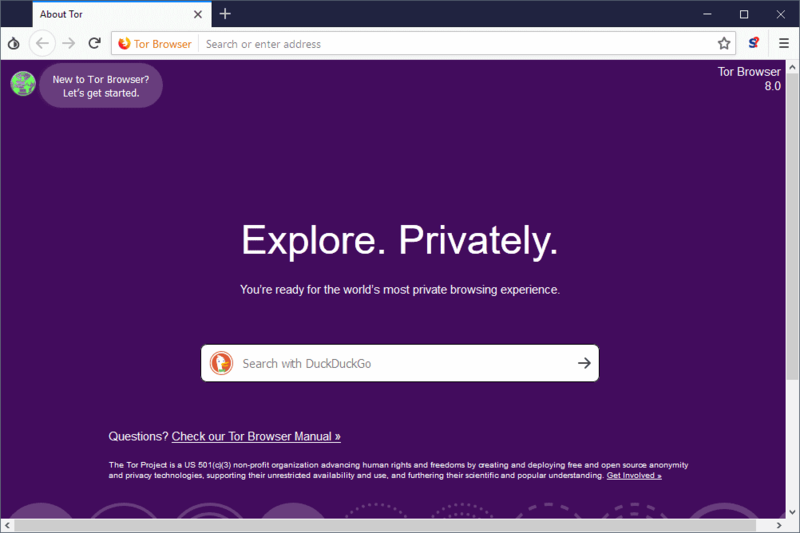 Tor Browser 8.0 is based on Firefox 60 ESR, more precisely Firefox 60.2 ESR, and no longer on Firefox 52 ESR. Mozilla modified Firefox since version 52.0 heavily and many of the changes found their way into the Tor browser as well. Note that this changes which extension can be installed in Tor among other things. You can check out our coverage of Firefox releases for information on these changes. Tor Browser 8.0 displays the Tor connection dialog on start just like it did before but the browser interface that opens loads a new onboarding experiencing designed to help new users understand better what Tor browser is and how to use the browser. A click on the "New to Tor Browser? Let's get started" link at the top of the interface opens descriptions and tips that explain core concepts of the browser to new users. The wizard offers information on privacy and the Tor network. Many of the features link to pages or settings. 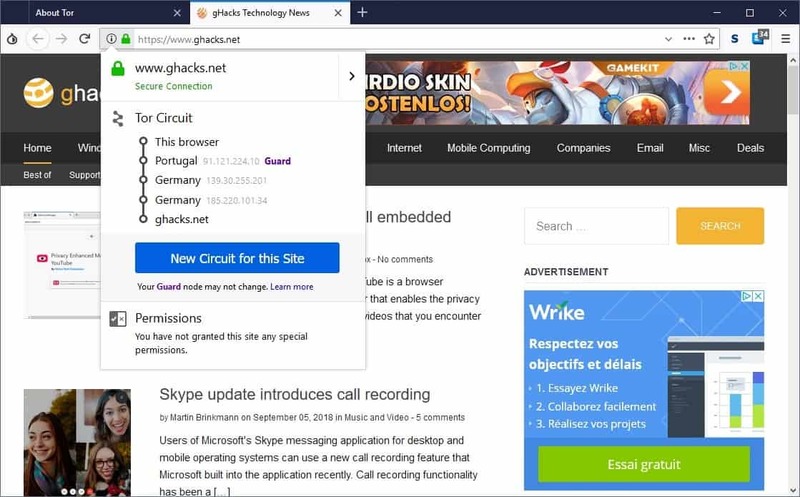 The Circuit Display link shows users how they can check the relays that a connection to a site uses, and the Security link leads to the Tor Browser Security Settings that users may modify to improve security further. The new onboarding experience assists new users in getting acquainted with the Tor browser. Veteran users may not need it at all but it is just displayed on first launch and can be ignored easily. Users can open the onboarding page at any time by loading about:tor in the browser. Bridge Fetching, the process of requesting new bridges, has been optimized in the new version. You had to send an email or visit a website in previous versions to request new bridges; the process changes in Tor Browser 8.0 as it is now possible to request new bridges from within the browser directly. Activate the Tor button in the browser interface and select Tor Network Settings. Enable the "Tor is censored in my country" checkbox on the page that opens. Select "Request a bridge from torproject.org". Solve the captcha that is displayed. Component and library upgrades to new versions. Reader View mode enabled again. Blocks navigator.mozAddonManager so that websites can't see it. You can check out the full release announcement on the official Tor Project website. Hardware acceleration works again on Windows. Finally. No more software video decoding, horrible scrolling and screen tearing. Tor 8.0 appears to now require Windows 7 or greater. Because Firefox 57+ requires Windows 7+. Afaik, Firefox 57 works on XP and Vista, so Fx 60 might work on systems lower than 7 as well. You might have to extract the “installer” with 7-zip though. @Yuliya No, since Firefox 53, it no longer works on anything lower than W7 sadly. @Q – well yes, because it’s based on Quantum. No more XP or Vista. I like Vista, though I’m perfectly OK seeing XP get buried. Although it is used everyday from the release of v8.0, it is comfortably working and functioning. Works on mine, and there’s no 8.1. The last non-alpha release is 8.0.1. Does anybody really trust TOR anymore? I don’t mean just for private browsing, but ya know… for patronizing drug markets and doing stuff you REALLY don’t want anyone finding out about. I read stories about the FBI hiring some university to crack the network, perhaps temporarily. But after that, it didn’t seem worth the risk anymore. I do, but I use it within whonix for extra security. If you’re really concerned, you should consider a VPN. You can also combine your VPN connection with a non-logging SOCKS5 proxy to give you additional protection. Do these results seem a little *fishy* to you? However, Mullvad states on their site that they don’t support IE, so the lower rating is understandable. I don’t have Tor installed at all. Mullvad accepts cash payments. A nice touch. Tor is trustworthy, but it’s not a panacea and you need to keep in mind what the limits and risks of it are (just as with anything else). The Tor browser is a different matter that I know nothing about. I use Tor systemwide (so it covers all internet activity, not just web browsing), I don’t use the Tor browser. How you can set the computer for systemwide usage? Is it on Windows or must be Linux? I use tor as portable standlone, not bundled. super duper better than any vpn! Each time you launch firefox (codebase upon which TorBrowser is based), firefox — the browser that “respecks yer privacy” — queries the O/S attempting to read/load FirstName, LastName from your useraccount data. It assigns this email address to a variable and retains it in memory throughout your browsing sessions. Why should my frickin’ WEB BROWSER have access to details associated with my WINDOWS LOGIN USER ACCOUNT ?!? note: this ff behavior isn’t restricted to Windows. The codebase contains similar, conditional, sniffing tailored to Mac and Unix OSes. I checked the mozilla xhr within the past year and confirmed that patch by torproject hasn’t been merged upstream ~~ firefox still reads/stores the user’s FIRSTNAME LASTNAME during each startup. Has the patch (and myriad others, submitted by the frightenly few folks who bother to pore through the “opensource” code, in search of bugs/problems) even survived the transition to “based on the more gooder ff version 60”? I doubt it has, but at this point I’m too tired (disillusioned, fed up) to bother re-checking. Obviously with the change from 52 to 60.2, there are a lot of changes, especially given the move to deprecate XUL – let alone all the new features/standards and big projects like all the quantum parts (stylo, webrender, photon, etc). I have no real idea of how they “merged” the 52 into 60.2 or vice-versa, but when doing all the diff between stable versions since 52 ( see https://github.com/ghacksuserjs/ghacks-user.js/issues?q=is%3Aissue+label%3Adiffs ), I can tell you that as quantum neared and for a few versions afterwards, the workload/changes was enormous. It’s only just starting to quieten back down to “normal” levels. This first version also still has old prefs being set in it that have been deprecated (but they make no difference) – but they’re aware of it. They also have prefs being set that change your FP (i.e they need to undo some pref flipping from the past in order for privacy.resistFingerprinting to be consistent) – but again, it makes no difference for now (because all TBB users are the same). https://bugzilla.mozilla.org/show_bug.cgi?id=1433350 – The code is a remnant used (or was used) in Thunderbird. It is not used in Firefox at all, and in time will be removed – meanwhile, if you follow the code, it doesn’t actually do anything. It’s all about priorities. This is extremely low priority, poses zero privacy/security risks, and given it has an upstream ticket via the Tor Uplift for Mozilla to handle, there’s nothing more to do (except monitor via Tor Uplift). The code does nothing and poses no risk? Gee, your dismissive reply reads like the words of an apologist. The issue ticket wasn’t marked “wontfix” and, ultimately, the torbrowser code was patched to resolve the issue. So, rather than dismissing, investigate determine the facts of the matter. It is lipservice, darling — a smoke and mirrors performance. Neither mozilla nor torproject are fully committed to protecting, and respecting, user privacy. Ultimately, they are $$$ engaged in perpetuating a big con, creating a “illusion of choice” by shipping alternative (yet thoroughly backdoored, e.g. targeted injection/exfiltration via maintenanceservice.exe) desktop-resident “agents of the same unseen master”. It wasn’t meant to be dismissive. Just because a ticket wasn’t marked wontfix, doesn’t mean it carries serious weight. It was probably kept open because it’s always nice to clean up code like that (and of course, when the ticket was opened, the Firefox code was different to now, so I do not know if it was a bigger issue then than now). But given it took 4 years to be closed, and the original patch created by a volunteer, should indicate to you that your concern was/is blown out of proportion. And no one said it wasn’t a good idea – Arthur even added it to the Tor Uplift so it could be patched at Mozilla’s end. I mentioned this, because it would be interesting to know. And that the dropping of previous patches is not a glitch in the system/methodology. Either it’s a mistake (to drop that patch) or done deliberately since they know it’s not serious and there is an upstream Mozilla ticket. Maybe they have it on a list, IDK. If you’re concerned about it, open a new tor ticket. Aww, you had me at “darling” :) Then you lost me with the conspiracy BS. > Why should my frickin’ WEB BROWSER have access to details associated with my WINDOWS LOGIN USER ACCOUNT ?!? I’ll answer your question AGAIN because it’s clearly not getting through to you: because it is code used by Thunderbird. Firefox itself does not use it. Did you actually read the bugzilla comments? – In Firefox, there is no downside to removing the code, and a modest reduction of risk to privacy by ensuring no future mozilla-central code calls these functions. Tor Browser 8 looks pretty good. One thing I don’t like is how it starts up in Private Browsing mode. This is okay if you are browsing for short sessions and you close your browser. But if you leave your browser open all the time, it would be better to use Multi-Account Containers (or better yet, use MAC in conjunction with the Temporary Containers addon). This is so when you close a tab, cookies and local storage are cleared for that tab. AFAIK, TBB used to change it’s circuits every 10 minutes. When a circuit changed (new identity) all persistent data is wiped (I am not 100% sure on this – but it certainly used to do so when you manually requested a new identity). Circuits get created on start-up and whenever Tor thinks it might need more in the future or right now. Once a circuit is actually used for the first time, it’ll be marked dirty. Dirty circuits are used for new connections for 10 minutes by default. After those 10 minutes, a dirty circuit will stick around for as long as connections are still going over it. If you’re just web browsing that might not be the case for long. However, if you are connected to IRC for instance it might be days. So, to summarize: a circuit lives for some amount of time before you use it, then for 10 minutes for new connections, and then for however long it takes for these connections to finish. But yeah, certainly would be nice if repeat first party visits (i.e when all tabs of the domain have been closed and you go to that domain again) would be protected (by clearing all persistent data including SSL session tickets etc). Although the threat model between Firefox and TBB is very different, so I’m not entirely sure of the actual gain in privacy here – probably some edge cases for sure. Is it possible to replace Firefox by Pale Moon with Tor browser? You can use Tor itself, rather than the Tor browser. If you do that, then all your internet activity (regardless of which browser you use) is covered. Searching the Net for info on standalone Tor, I came across Vidalia, a cross-platform graphical frontend for Tor that I *think* I used to use in Windows XP, but I see on Wikipedia that it’s been discontinued. (I vaguely recall that the EFF used to offer a “Vidalia Bundle” that included Tor, Privoxy, and Vidalia.) I see there’s a new graphical frontend called SelekTOR that’s just for Linux, but I don’t know anything about it. Ok thanks. I understand if I want to use Tor with another browser I have to be a geek. @Anonymous: Yes. Because who wants to spend all of their time browsing when they can instead spend all of it making sure their browsing is secure? ;-) But seriously, I welcome this development with the same disappointment and resignation I welcomed the replacement of Classic Theme Restorer with CSS tweaking in Firefox … except that it may actually be worth doing, now that American ISPs are allowed to sell their customers’ Internet activity. The silver lining, I guess, is that when I migrate to Linux, using standalone Tor might actually be easier, if SelekTOR lives up to its claims. whoer.net now correctly detects my real OS no matter how many times I choose a New Identity; this never happened before! They haven’t decided what to do with the UA spoofing yet. In FF they spoof the OS as one of four (Windows, OSX, Android, Linux) with Linux being the fallback. The reasons (in Firefox) are twofold: 1. site breakage, lots of quirks and bugs (eg desktop pages served on mobile, keyboard issues) and 2. there are many other ways to determine the OS (*one* example is tcp/ip packet characteristics). The *main* reason is point 1 – FF needs to work for people (for uptake). Note that the UA string is sent in headers, so JS doesn’t really play a role here (except to limit exposure of lying). FF and TBB have different threat models. For FF, sites need to work, and for reason 1 above, that is enough justification to limit OS to 4 variants. TBB on the other hand can break things and people will expect this given the browser’s mission. JS is disabled by default (so this limits exposure of OS via other means) .. in fact the TCP/IP fingerprinting thing isn’t even an issue via Tor, and other tightened areas also limit OS FP’ing (eg font sets). Another thing to consider for TBB, is that most sites would not dig this deep to detect the real OS, so why offer more entropy when you don’t “have” to. For those 1% or 0.1% of sites that do, big deal – they didn’t gain any more data than if you had given them the real OS anyway. So for TBB there is a real net benefit to spoofing the OS to windows only. Just my take on it : for some reason, this update has suddenly made Tor “spring to life” and work better than it ever has done. It doesn’t feel sluggish and more, and some HTML5 speed tests look better than ever. It almost feels like its not Tor. I’ve never much used Tor, as it just seemed to slow. But it feels like its been really turbo boosted for me, right now, and after this update. If this continues, I might just use it more. I’m amazed, quite frankly!! I agree. It’s faster now. And the interface is cleaner, more modern. I agree. The interface is modern and more faster. It’s cleaner now. I noticed “guard node” (first node) that can’t be changed (look second image from above). Whats this all about, does anyone knows? It’s nothing new. Just that they made it more visible, and added the word “guard”, which wasn’t there before. But the concept hasn’t changed. Technically, it has always been the first of three nodes. It does not change for a given user for 2 to 3 months (and then it might), in order to prevent some de-anonymising attacks. I’m guessing Martin’s using Windows Dark theme. Don’t like the fact that Tor 8.0 copies your Windows title bar and (tiny)border color. Ver. 7.5.6 kept the generic gray color. My Windows title bar color is something I selected from the palette, just a color that looks nice to me, should be close to unique. Whether changing the title bar color is a privacy concern, IDK, seems like it could be. Hardware acceleration can be a privacy issue also. Tor isn’t intended to be a VPN replacement; I hope the new more mainstream look (at least as far as FF is mainstream) doesn’t attract a lot of new privacy seeking users and bog down the network to the point where it’s as slow as it was years ago. I’ll continue using ver 7.5.6 for now with the updater disabled. TB8 is very strange. I don’t see tor circuit. I don’t know if the JS are turned on or off. “Hmm. That address doesn’t look right. Hm, works fine on my end. Can you post a screenshot that shows the address and error? The “problem” mysteriously disappeared. Not sure what caused it. BTW, I didn’t like the default settings of NoScript, too much was allowed. That wasn’t the case with previous versions of the Tor browser iirc. This update is an example of why people turn off auto updates. I change tabs way more than I use menu items.. doesn’t it just make sense to have the closest to the page items be the most used items? Seriously, if you can’t read, what are you doing with TOR? Without text instead of icons (that I can barely see) a browser is useless to me. Most of the browsers out there have succumbed to the lowest common denominator of intelligence.. pictures instead of text is childish or for people that cannot read. A simple fix is classic theme restorer (add on) but annoyingly, doesn’t work with this update. I have no idea whether it will work long term — meaning however long the previous version of Tor Browser remains safe to use, which may not be all that long — so I created a backup copy of its entire portable program folder, just in case it didn’t. However, I’ve run it briefly a couple/few times, and it hasn’t attempted to auto-update yet. In the real long term, however, it probably safer for those of us who prefer browsers that support XUL/XPCOM extensions — Pale Moon and (for now) Waterfox — to run Tor as a standalone and then run the latest version of our favorite browser on top of that. Unfortunately, that seems to require a lot more work to set up than it used to. I think it will eventually. I increased all the numerical values to the highest they would go in about:config app.update.xxxx settings, removed all the links and it still updated after some time. (just delete any subfolders, files in updates). Now I’m back to 7.5.6 with the gray title bar, etc. No updates after a day open, works fine. Tor’s so simple, experimentation is without all the potential Firefox pitfalls, just delete the folder (keep the downloaded installer) and reinstall. Tor saves temp files somewhere, Disc Cleanup between installs kept immediate updates from occurring during experimentation. Thanks. Another big update of a software buggy, so common nowadays. I continue to like the new Tor. However, don’t know if anyone can answer this? I don’t want to add a “Toggle JS on/off” extension, (though I’m tempted) as they all will undermine Tor, by virtue of “permissions” , and adding extensions to Tor is not recommended. Noscript is of course included, but that has no JS toggle, and you have to know the address of the site you want to visit, in order to add it to Noscript, BEFORE you even visit that site….so it can’t be considered as a simple, clear, toggle. Why is there no setting in the interface, and how have others managed to use Tor in a complete “no-JS” environment, without undue complications in the process? No problem. I don’t think this has changed. Ah yes, thank you Clairvaux. I’m aware of that slider, but overlooked it completely in favour of some kind of radio button or switch. @Clairvaux – thanks for the link. I don’t agree with the commenters assertion that Tor is now “horrible”. In fact, it seems to be working better for me than ever, and I might actually use it for a change, instead of having it sit dormant. Of course, people don’t like change. I do think though, that there should be a toggle on the toolbar,menu bar,title bar along the top….provided integrally, to just turn JS on and off, instead of having to click through to a slider. I like to be able to reach that real quick and easy…right in front of me. Just my preference! Was not quite sure what you meant about (mild) bug? You might mean that Ghacks comments section was misbehaving again. Sadly something we experience these days, though having an account seems to have fixed that (if that’s what you were referring to). I was speaking of the bug some Reddit commenters identified : apparently, the upgrade to Tor 8 did not respect previous security settings, and the slider had to be readjusted. Maybe you experienced the same thing. I agree Tor has become so reactive now, that we might even experience a shortage of servers, which are already rather thin on the ground. Waht are those Ghacks accounts ? I don’t see anything like that. @Clairvaux. Thank you for the clarification(s). I didn’t have a Reddit problem, but I did read your link. I hope Tor is not taken up in such numbers, that everything grinds to a halt. It really has been faster, and actually usable. I found that with a proper Ghacks account, my comments appear immediately. Before, there was often a big lag, causing some issues. Could you please enlighten me on those “proper Ghacks accounts” ? I can see nothing of the sort on the site. I see a subscription option for newsletters, but that does not seem to be an account proper. I don’t use it, because I have subscribed to the Ghacks RSS feed, which suits me better. I just subscribe to mail alerts when posting a comment, each time. I don’t mind that much my comments not appearing immediately. What I do find problematic is receiving mail alerts on comments before they have appeared on the site. You can’t then use the alerts to reply to a comment, unless you’re willing to break the logical layout of the blog, and reply without your comment appearing as a reply. And possibly confusing readers, by replying to something they haven’t yet read. comment came to me as a mail alert at a time it was not yet visible on the blog — and then I made an exception to my workflow, by “pre-replying” to it per my September 7, 2018 at 9:36 pm comment ? Hi, feel free to use the contact form to contact me. I can create a (free of course) account here on this site which does away with the caching. So, anything that gets posted should show up immediately. Content that is in moderation still needs to be moderated before it becomes available though. The email for comments before they appear may be a caching issue which should resolve itself when you use the account. Message sent, thank you very much. That information (by Tracy Knauer • December 29, 2015) is way too old. Tor Browser 8.0 is “based on Mozilla Firefox 60.2.0 esr”. “HTTPS encryption” is implemented in Browser. The essence of “Tor” is countermeasures against Fingerprinting. It is a specification whose config related to fingerprinting is set to “false”. Classic Theme Restorer is also an essential addon I use all the time. @TelV, I understood the claim. Certainly “HTTPS encryption” is, that’s right. End-to-end measures, is another means. For example, use of Nord VPN etc. Issues related to LegacyAddons is “put the cart before the horse”, it seems that personal value judgments. At least “Tor Browser 8.0 is” based on Mozilla Firefox 60.2.0 esr “is better than any other Browser. By the way, my main Browser is Firefox (ESR, beta, Dev, Tor), but I also use Waterfox, Pale Moon, SeaMonkey, Brave, Iridium, Vivaldi (stable), Otter, Konqueror. It is a personal opinion based on those experiences. P.S. I was disappointed that Legacyaddons became unavailable. However, now it avoids it by “to use properly.”, and I am satisfied with the newborn Firefox. Overview of “All uploads fail” can not be understood. Because circumstances and coping differ depending on the system environment being used, it is better to use official FAQ or official SUPPORT. ・I installed Tor but it’s not working.